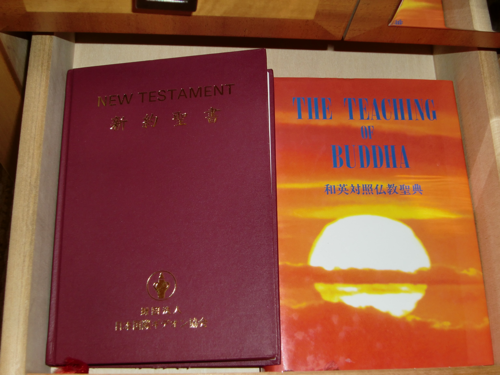 Thanks to tweets via @djbuddha via @atlasien via @discovernikkei, I was pointed to Loco in Yokohama, who found a surprise next to the New Testament in his hotel room. Yes, that book is amazing and the wonderful people responsible for it - Bukkyo Dendo Kyokai, or the Society for the Promotion of Buddhism - have published literally millions of copies in dozens of languages. In Japan they are commonly found in hotels but have also been distributed free of charge in many places around the world. Thank you very much for the info, Marcus! Back in 1987 I found a copy of this in nearly every hotel room in Taiwan. I took the address from the book and sent a donation and they sent me my own copy. Thanks for the link Marcus-I know a couple of people who would like to get a copy as well.